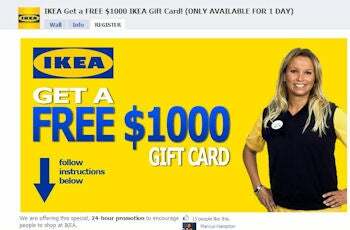 About 40,000 Facebook users become fans of this fake Ikea gift card page Friday. This type of page -- typically created by unscrupulous online marketers -- is a growing problem on Facebook. 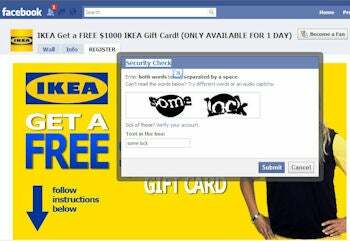 Ironically, Facebook's captcha security prevents automated systems from entering data on the scam Ikea gift card page. Facebook says it is developing automated tools to prevent this type of fan page from going viral, but on Friday, 40,000 people joined this group which offered a fake $1,000 gift card. After becoming fans of the fake page and inviting all friends, victims ar ethen directed to a Web site off of Facebook, where they are asked to enter personal information, including their birth date, home address and telephone numbers. But wait, there's one more catch. 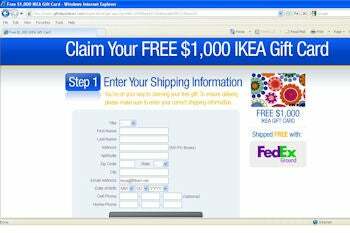 To cash in on click referral bucks from legitimate sites, the scammers now ask the victim to sign up for legitimate Web sites such as Netflix, CreditReport.com, and VideoProfessor.com to claim their gift. Experts say the gift card never comes.